Not all boreholes are the same – scientists using mobile equipment measured how many gaseous compounds are emitted by the extraction of oil and natural gas in the US. This is the first time an analysis like this has been conducted at a high temporal resolution using a vapor capture system, and the results show that some boreholes have 100 times more emissions than others; the mean value exceeds levels considered safe for humans by 1,000. 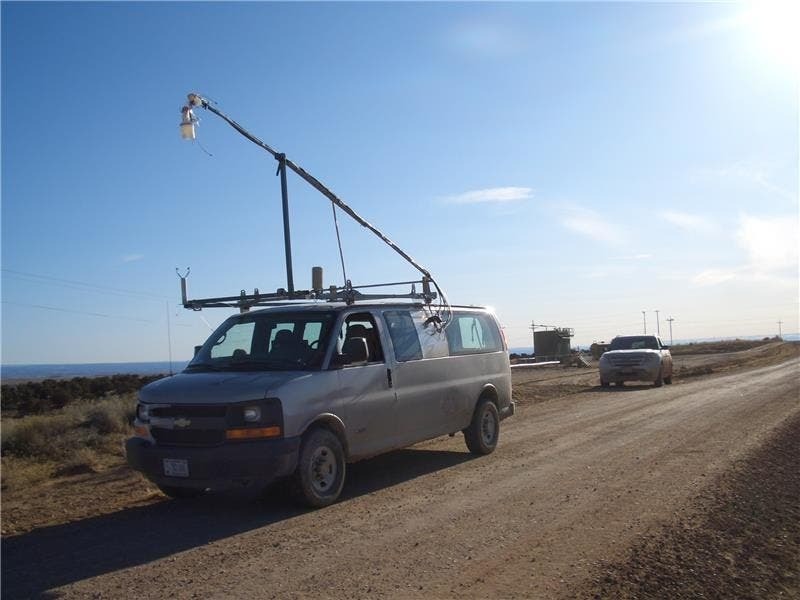 The KIT measurement instrument on board of a minivan directly measures atmospheric emissions on site with a high temporal resolution. There is a lot of debate about hydraulic fracturing (often called just “fracking”), with the industry (and some researchers) claiming that the technique is totally safe and there is absolutely nothing to worry, and many other scientists claiming that there are serious hazards associated with fracking. The long term environmental effect of fracking is not fully understood, and this is a problem in itself. Sure, in its history, humanity has relied on many industrial techniques which have proven to be (let’s say) less than ideal, but we’d like to think that we are now at a stage where we can actually forecast the impact which we will have. Many people are worried because the “recipe” of the fracking fluid is kept secret, and about a third of fracking chemicals are of unknown toxicity. The industry argues that drilling for shale gas takes place very deep and there is no risk of water contamination, but a study conducted by the Environmental Protection Agency found that fracking often takes place in shallow regions. Researchers at University of Texas at Arlington also found high levels of arsenic contamination in groundwater near fracking sites and a report published in November this year showed that 40% of Wisconsin ‘Frac Sand’ producers violated environmental rules. There seems to be clear reasons to worry about the environmental impact of fracking, and that’s not even all of it – the actual fracking process can lead to dramatically increased seismicity, as it was shown in Oklahoma. Now, scientists from the Karlsruhe University in Germany have added another question mark to the safety of hydraulic fracking. Together with the National Oceanic and Atmospheric Administration, they measured emission of trace gases by oil and gas fields, analyzing background concentrations and the waste gas plumes of single extraction plants and fracking facilities. Their measurements focused mostly on health-damaging aromatic hydrocarbons in air, such as carcinogenic benzene. They found huge discrepancies between different boreholes, with some emitting a hundred times more than others. The highest values of some milligrams of benzene per cubic meter air were measured downstream of an open fracking facility, where returning drilling fluid is stored in open tanks and basins. Much better results were reported in fracking facilities with closed production processes. In countries like Germany, the emissions are regulated by law, with an annual benzene limit of five micrograms per cubic meter set for the protection of human health. The mean values observed now in the US surpass that limit by a factor of one thousand. Fracking is discussed more an more as a possibility to extract fossil fuels from non-convenional reservois and the economic potential is huge – but as this study points out, we still don’t fully understand the health and environmental effects. Hopefully, we will be able to learn from our past mistakes and find a favorable trade-off.